Although Eucalyptus leucoxylon is a varied species, it is Eucalyptus leucoxylon ssp leucoxylon that is commonly known as the Yellow Gum. Itself varied in growth habit from a small to tall tree with white to cream or pink to red flowers from autumn through to spring. 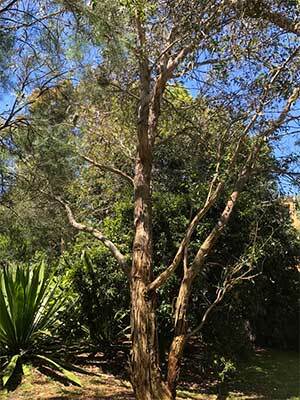 This is a tree that is found widely from south Australia, through Victoria into New south Wales. Once the climate is more humid such as Sydney and further north it is not found. Use this tree as a street tree, screening plant or windbreak tree. Its natural open habit makes it a useful shade tree in larger parks and rural settings. Given a reasonable well drained soil, this is not a fussy plant at all. It will not grow well in humid climates. Common Name – Yellow gum. Spread – 10 to 15 metres. Soil – Well drained, will grow in poorer soils. Attractions – Shade tree that grows in poor soils. Flowers – White to Cream and red. Eucalyptus leucoxylon megalocarpa – Largefruited Yellow Gum.